I love bottle shares! What’s a bottle share? Great question. Let me explain. The concept is pretty easy. Gather a small group of people who like beer, have them bring a couple of bottles of random beer they haven’t tried yet and if everyone else follows suit and does the same thing you’ll have the opportunity to try a heck of a lot of different beer at once. Easy right? The hardest part of having a bottle share is finding a host and picking a date, people are busy. Once we had someone volunteer their house as tribute and picked a date far out enough that everyone could plan accordingly we were ready to go! We used Facebook events to organize and communicate with those invited. 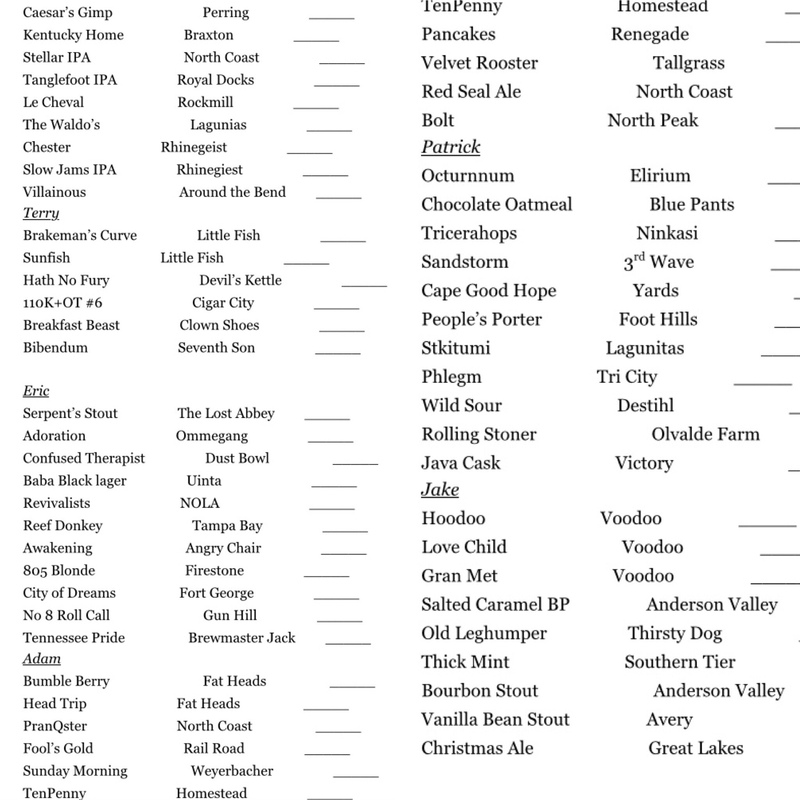 It let us post what we’re bringing so we didn’t have a lot of duplicates, obviously because we want to try a lot of different beer from different breweries and places we don’t always have access to regularly. We definitely accomplished this. 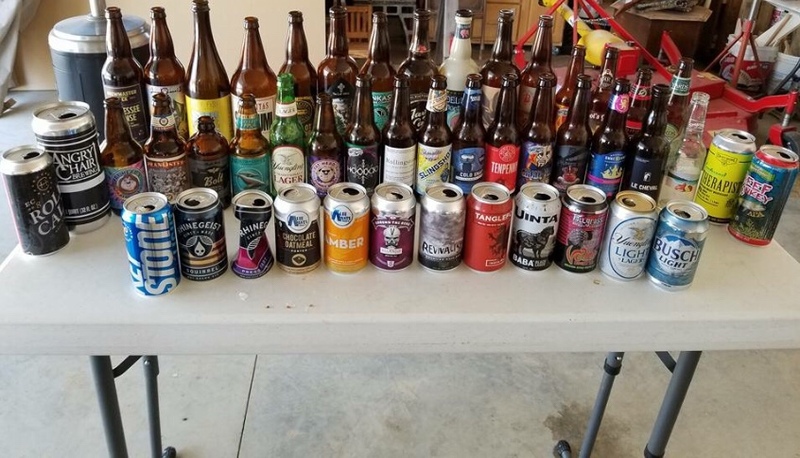 Overall we only had about 10 people attend and over 60 beers to try this past fine Saturday. We had one guy buy a boatload of beer while he was in Florida a couple of weeks ago. He brought back a lot of beer for us, most notably beer from a brewery in Tampa this blog has mentioned before in Beer of the American . Cigar City Brewing is world famous and now I know why, the beer was amazing. Of course, local bottle shops like Cappy’s and Jungle Jims are a great place to pick out a couple of bottles you’ve never seen before. They always have something new every time you go in to one of those places. We had beer from everywhere though. Pennsylvania, Florida, Ohio, Illinois, California and others were all represented. We threw in a wrinkle to this share though. We wanted to do something a little different so we came up with the idea to award one beer a “Best in Show” for the day. We narrowed it down to 3 beers then voted on our favorite from the day. We had a good time catching up with people we hadn’t seen for a while all while drinking some top notch beer. – The Awakening from Angry Chair Brewing a coffee milk stout with vanilla beans and cocoa nibs. 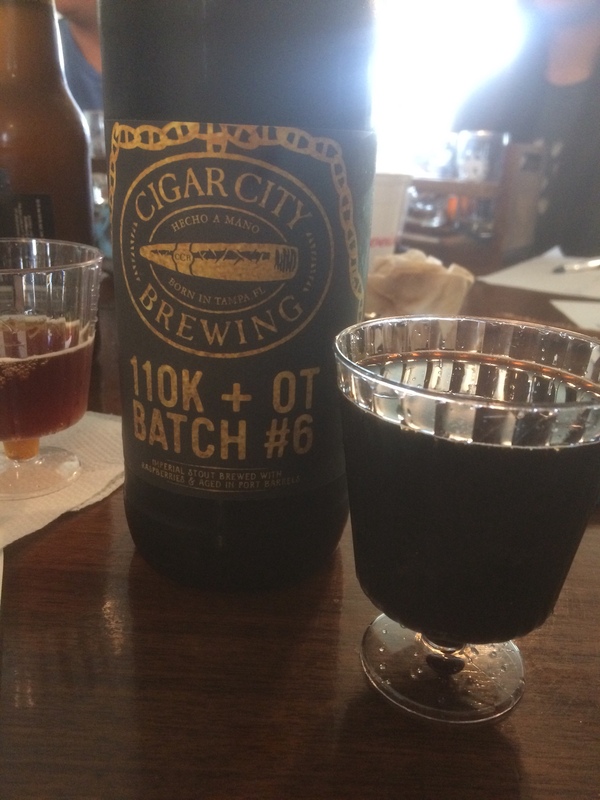 – 110K + OT Batch 6 from Cigar City Brewing. Cigar City is in Tampa, FL. This beer is no longer in production so I’m sure there’s only a finite amount left if the world. It’s an Imperial Russian stout with raspberries and aged in port barrels. It was outstanding and at 11% ABV you get a plenty from the barrel and the raspberry finish. – Cape Good Hope IPA from Yards Brewing. Yards is located in Philadelphia, PA. It was the 2017 version of the Double IPA. IStrong enough to know you’re drinking but very smooth to keep you going. It checks in with an ABV of 9.7 and 76 in IBUs. The Awakening from Angry Chair, a beer I gave a 5 on Untappd. Angry Chair Brewing is in Tampa, FL. The beer itself we had from a crowler. The brewery says its a coffee milk stout with vanilla beans and cocoa nibs and it is brewed with Buddy Brew Coffee. The roasted coffee beans really come through along with vanilla to make it an easy drinker. At 7.4% ABV you’ll know you’re drinking it sooner than later. Overall, we had a great time and drank way too much but tried so many awesome beers. 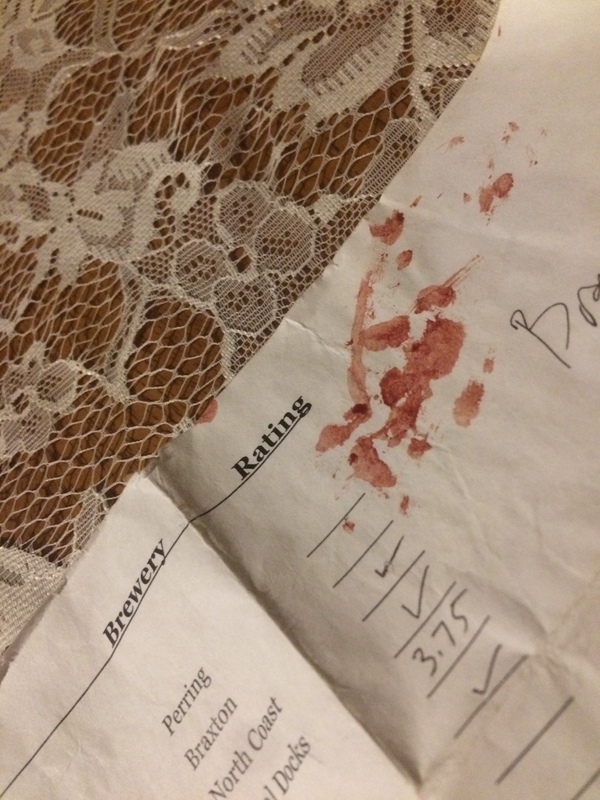 I even shed blood, but that’s another story for another time. There are already talks of another bottle share coming soon!